An arrangement that is exquisite as its name suggests. 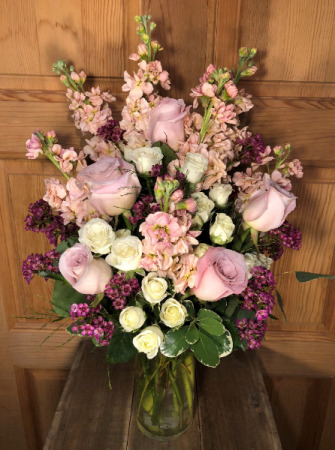 This bouquet has pale pink stock, mini spray roses, full size roses, and fuchsia wax flower. Show your appreciation with these spectacular flowers. Order from us today! Pops of pink mini carnations and white cushion poms stand out from green button poms in this cheerful arrangement. Show your appreciation with fresh flowers that are sure to make them smile! 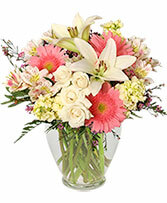 Call us at TWIGS & VINES FLORAL or order online flowers now.